A reorganization is shaking up the leadership at the University of Minnesota's Medical School. The current dean will step aside this summer as her job is absorbed into another position. University officials say it's part of an effort to save money. The reorganization comes after criticism of the dean's efforts at preventing conflict of interest at the medical school. St. Paul, Minn. — The reorganization plan was announced in a memo from U of M President Robert Bruininks to the school's Board of Regents. The memo, obtained by MPR news, outlines a plan to combine leadership positions at the medical school and the University's Academic Health Center on July 1st. Deborah Powell's position as the U's medical school dean will be merged with the senior vice president for Academic Health Services. That job is currently filled by Frank Cerra. After a summer transition period, a search will begin to fill that new leadership role in the fall. Calls to the medical school and to Bruinicks were directed to University spokesman Dan Wolter. "The goal here is to first and foremost to consolidate and strengthen leadership in the medical school and to achieve cost savings." The move is not based on Powell's performance as dean, Wolter said. "Dean Powell has been a strong and effective leader at the medical school and she will stay with us in a role in a role of medical education." Some were critical of Powell when in 2006, she accepted a paid position on Pepsi's corporate board. Those critics said it was a conflict of interest for the dean to sit on the board of a company that produces products that are linked to health problems like obesity and tooth decay. Powell defended her position and said it was a chance to have her voice heard by the leadership of the company. 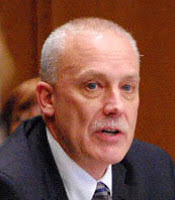 In 2007, Dean Powell formed a task force to revamp the medical school's conflict of interest policy. That policy governs interaction between the U's doctors and researchers and medical companies. Some task force members said proposed changes to the policy didn't go far enough in preventing conflict of interest. 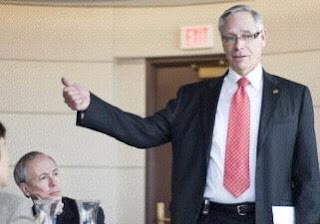 Powell faced more criticism late last year after the Star Tribune reported task force co-chair Dr. Leo Furcht was reprimanded in 2004 by Dean Powell herself for violating the school's conflict of interest policy. That policy is still being developed and has not been released. I want to share with all of you the memo below from President Bruininks in which he outlines his decision to combine the position of Senior Vice President for Health Sciences with that of Dean of the Medical School. We are at the very beginning of the transitional work this will require, and I’m certain you have many questions about the impact of this news on you and your department or division. In short, there is much work to be done before we have answers to many of those questions. However, I can tell you that the University of Minnesota’s Medical School remains one of the most important assets of the University, and the public depends on the work we do to sustain the health of both families and the economy. We are indebted to Dean Powell for her leadership over the past several years. She and I are working together on transition issues and discussing a future administrative role for her in the area of medical education. I plan to engage all of you in the work that needs to be done. Please feel free to contact me on my direct e-mail at cerra001@umn.edu with any questions or concerns. The feared chop from the Governor came. This isn't necessarily the end of the story, but it is time for OurLeader to roll up his sleeves and start giving serious consideration as to how to solve our problems. I hear rumors that Driven to Discover may be finally going down. How about an official end to the Strategic Propaganda Initiative and ambitious aspirations for becoming one of the top three public research universities in the world [sic]? Everyone who can should go to the conversation OurProvost is holding this Thursday afternoon. Information here. In a move that would cut $151 million from the University of Minnesota’s state aid over the next two years, Gov. Tim Pawlenty proposed a cut Tuesday of more than 8 percent from state higher education for the upcoming 2010-11 biennium. There has been speculation that the state could receive more than $3 billion in federal money, a sum that Pawlenty said would contain some money for higher education. Pawlenty said he would continue to push for a cap on tuition increases at state schools at a rate close to inflation, but beyond that would let the University’s Board of Regents and the Minnesota State Colleges and Universities system Board of Trustees determine how to deal with their share of the cut. University President Bob Bruininks said he was disappointed Pawlenty didn’t make higher education a priority in his budget. “I don’t believe you can have a strong, vibrant economy if you don’t make higher education a priority,” he said. While voicing his opposition to the proposed tuition increase cap, Bruininks said students would not face a large tuition increase. “We have no intention of putting these reductions on the back of students,” he said. In 2003, the state cut more than $198 million from the University’s budget. Tuition increased more than 14 percent each of the two subsequent school years. Bruininks said to avoid similar increases, the University would first look to cut costs and delay investments before raising tuition. Higher education currently makes up more than $3 billion in state expenditures. At 8.5 percent, it would be the fourth largest share of the state’s general fund in Pawlenty’s proposed budget. Rep. Tom Rukavina , DFL-Virginia and chairman of the House Higher Education and Workforce Development Finance and Policy Division, said the state would need to find additional revenue sources to close out the deficit. While meeting with Bruininks on campus Tuesday, Pappas said the state needs to remain committed to supporting students. “We don’t want to impact their quality [of education], and we don’t want to make them pay more,” she said. Echoing Rukavina, Pappas said Pawlenty is not “putting everything on the table” when it comes to finding more revenue sources. Kudos to Pappas, Rukavina, and even, gasp, Bruininks for their positions. I am glad to finally see Bruininks commit to no large tuition increase. This is a late conversion, but late is always better than never. UD posts on Dr. Mejicano's CME dilemma over in Badgerland. This doc has been continuing to shill for hormone therapy for menopausal women. The poor man has been harrassed by the Wisconsin Sentinel Journal and the university finally took down the website once the paper got wind of it. Life is so unfair... The media just picks on these docs so unmercilessly. We Don't Do No Stinking Walking! Bruininks, railing against Pawlenty’s goal to cap tuition increases at state schools this session, said tuition increases would be on the table, but would be, “the last thing on the list” of possible revenue sources for the University. State funds make up 70 percent of funding for the University, Bruininks said. It accounts for more than three quarters of total spending on both student services and faculty compensation. “[Bruininks] understands the responsibility of the University to the Bell Museum, and our stewardship of the state institution and that’s why we are back with this request again,” [VP Kathleen] O’Brien said. Don't these statements seem even a little contradictory? “[Bruininks] understands the responsibility of the University to the Bell Museum, and our stewardship of the state institution and that’s why we are back with this request [a new Bell museum building] again,” O’Brien said. I'd also ask about all the reports this century detailing how the portion of true per-credit costs that the state picks up, reportedly now less than 25% (down from close to 50% a generation ago), can be reconciled against the statement here that the state, and tuition, provides 70% of funding for the U? I'd assume this means that the state is picking up roughly 20%+ of costs that would otherwise be part of a higher tuition, for everybody; and furthermore that state grants to individual students based on need inflate that 20-25% figure up to a whopping 70%? Can that be possible? You'd have to have the the large majority of students receiving a large majority of their tuition funding from the state in order to have the state directly funding 70% when tuition costs in general are only picked up to the tune of 20-25%. So say the math. Maybe we should try this at the U of M and at Fairview-University Hospital? Mayo Clinic entered the blogosphere Thursday morning with a blog where patients and employees can post comments. "People like to talk about their experience at Mayo, and actually look for ways to do that," said Dr. Thoralf Sundt, a heart surgeon and chair of Mayo's marketing committee. The blog, "Sharing Mayo Clinic," (http://sharing.mayoclinic.org) will focus on positive patient experiences. But it will also accept criticism, along with family stories and posts from Mayo employees. Mayo has begun using social networking options extensively as a marketing tools, including FaceBook and YouTube. More than 500,000 unique Mayo patients get treated yearly, the blog says. "These patients and their families and friends, and 50,000 employees and students are part of a global Mayo Clinic community," the blog says. "The goal for the Sharing Mayo Clinic blog is to provide a virtual place for this community to connect and share their experiences." Sundt said there's a queue of people waiting to make blog posts. "This is exciting as it will enable patients and their families to tell their stories about their experiences at Mayo, and to offer a behind-the-scenes view of Mayo from various employee perspectives," said spokeswoman Elizabeth Rice. The most-popular Mayo Web links have been for patient stories, which led Mayo to start the blog. More than 90 percent of people who comment about Mayo give praise, Sundt said, and each person with a good experience tells 40 other people about it. Now, Sundt said, "we're just sort of giving them the platform to share." The blog is monitored for language and content. But, in general, Mayo wants an open forum that accepts most comments. Mayo officials also hope for suggestions about how to improve quality of service. They expect patients to share tips about how to best use time between appointments, and about Mayo services. "The quality of the experience is key," Sundt said. Ah, openness and transparency, isn't it great? Now if Mayo could just get on board with their conflict of interest policy... But then, nobody's perfect, right, Bob? The latest ethics scandal at the University of Minnesota involving the dean of the medical school and a faculty member she appointed to review and improve ethical practices who turned out to have a whopping and profitable conflict of interest himself, underscores the need for a president who is more interested in the academic side of University life than in the athletic side. We must not allow another ethics scandal to occur on anyone’s watch at our once-proud University. UD’s covered the decline of UM for a long time. She concludes that the university needs a new president. Conflict of Interest at the U Medical School? In the Minnesota Daily, a very pissed professor says what needs to be said. It would be nice if the newspaper received five or ten of these a day. But only a few professors have the guts to write them. The author is Eva von Dassow. No ancient religion, of course, can hope to compete on her campus with the Glory of the Gridiron. Last fall, upon concluding the Community Fund Drive, the University of Minnesota administration imposed a “hiring pause” in anticipation of reduced state support. Faculty and staff positions that become vacant will not be refilled. Most searches for new faculty, including replacements, have been cancelled. Funding for teaching assistants is to be reduced. There will thus be fewer instructors to teach courses; therefore, fewer courses will be taught. Students will not be provided the full curricula they were offered when they decided to come to the University. Many students will be unable to complete their degree programs in their intended form — at least not in a timely fashion. Programs that were already understaffed are being crippled and students are left with inadequate course offerings to meet their needs. Meanwhile, the administration proposes to raise tuition even higher. I invite the University community to consider how the administration’s cancellation of faculty searches comports with the University’s core mission and stated goals, the larger financial picture and the annual tuition hikes. Note that we are not talking about increasing the numbers of faculty through incremental hires, but simply about preserving what we had up through last spring. Having chaired one of the cancelled searches, I can attest that hiring new faculty is a labor-intensive process. We had almost carried the search to a successful conclusion; after the long process of reading applications and conducting preliminary interviews, we had identified three excellent candidates to invite to campus. Then, on Dec. 9, the bulk of our work having been completed, CLA notified CNES that our search was cancelled. The time and effort put forth by faculty, students and staff to conduct the search had been wasted. For what? To save the cost of hiring a starting assistant professor, whose salary would be in the range of $55,000 per year, plus benefits. Compare that to the salaries of top administrators and athletics coaches. It’s nice that the University’s top brass froze executive compensation upon imposing the hiring pause. But it doesn’t hurt to have your salary frozen at several hundred thousand dollars per year. President Bob Bruininks said in a Dec. 4 e-mail message to employees that the administration’s objectives during the current economic crisis are to “maintain the core strength and quality of the University” and to “increase productivity … while improving service and efficiency.” How does cutting faculty positions serve to maintain quality? How does it improve service and efficiency to withdraw curriculum from students trying to complete degrees? How does it increase productivity to waste employees’ time by canceling searches that are underway? I could have taught an entire course in the time I spent chairing the search in ancient religion or used that time for research. Besides reducing productivity, when the University administration throws our time away, it throws away its putative commitment to excellence. The administration’s communications addressing the University’s financial problems always refer to the state, the state’s budget deficit and the state’s appropriation to the University — as if the hiring pause, with all its consequences, simply results from Minnesota’s strained economic situation. I submit that the University’s financial position would be much better now if the administration had not chosen to spend large sums on things it wanted, regardless of whether those things have anything to do with the University’s core academic mission. This past year has seen the purchase of a new financial system — essentially a software package — for the price of $28 million. The old financial system worked fine; the new one does not. Everyone can point to favorite examples of profligate spending, and most would point first at athletics (the costly new stadium and the high salaries of coaches) or at administration (the ever-increasing number of vice presidents), with its many “initiatives” of dubious purpose and effectiveness (notably the Strategic Propaganda Initiative, as it would rightly be called). Few would point to academics and claim we have too many faculty teaching too many courses, doing too much research and working with too many students. But it is we who are the University: the faculty and students — and, yes, the coaches, too — together with the staff who facilitate our work. The administration is not the University but, properly, its servant. This administration serves the University ill by reducing faculty positions and thereby decimating academic programs. 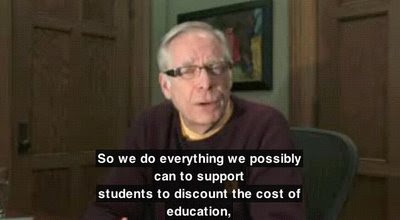 It does a disservice to students and, thus, to Minnesota by cutting instruction and curriculum while raising tuition. Students: You came here expecting better. Don’t settle for less while you’re asked to pay more. Eva von Dassow is an associate professor. Thank you Professor von Dassow for speaking up. I hope that others will also. It is time for a re-ordering of priorities at the University of Minnesota. The Strategic Propaganda Initiative as well as the laughable "ambitious aspiration to be one of the top three public research universities in the world [sic] " are exacerbating this disaster. The latest shocker is reported in the WSJ and concerns a huge problem in Badgerland. A prominent spine surgeon and researcher at the University of Wisconsin received $19 million in payment over five years from Medtronic Inc., one of the country's largest makers of spinal devices, according to a senator who is investigating potential conflicts of interest in medicine. Expanding research may be a worthy goal in higher education, but doing so comes with significant costs that aren’t recovered by grants alone, according to a study published in Academic Medicine this month. Researchers at the University of Rochester School of Medicine & Dentistry found that the cost of supporting newly recruited scientists costs an additional 40 cents over every dollar these new faculty generate from grants. While colleges may grow in prestige by expanding their research base, they’re likely to dole out more money in start-up packages and other benefits for new faculty than they bring in through grants, the study asserts. The landscape of federal funding for research has also changed since Rochester began its study in 1999, which marked the start of a now-dwindling effort by Congress to double the budget for the National Institutes of Health. With those dollars drying up, it’s possible that colleges will see even larger shortfalls as they expand research operations, Guzick said. Something to think about President Bruininks, Provost Cerra, Mr. Pfutzenreuter? "We know the stress that tuition puts on students and we're doing everything we can to cushion that increase," Pfutzenreuter [University of Minnesota Chief Financial Officer] said. "We're going to continue that effort as we move into the next round of budget reductions." 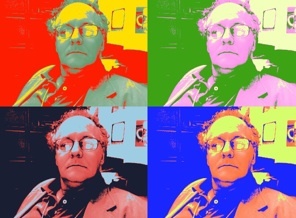 "Will the Regents support a 7.5% tuition increase, Professor Martin asked? They have been told it is part of the budget plans, Mr. Pfutzenreuter said. Professor Chapman suggested that 7.5% will be seen as quite high. Mr. Pfutzenreuter agreed but pointed out that for Minnesota residents the legislature provided funding to buy down the increase by 2%, so it will only be 5.5% (for students from households with an income of up to $150,000). Professor Chapman said he was sorry to see such an increase in an election year; Mr. Pfutzenreuter said the other choices are increased state funding or less new investment." Did MPR deliver noisy LRT ultimatum? MPR will sue unless light-rail is silent and vibration-free — at least in front of its doors, the PiPress' Dave Orrick reports. MPR's Bill Kling delivered the March 1 "ultimatum" that demanded alignment veto power, though the PiPress doesn't quote anything that sounds so absolute. An MPR spokesperson disputes the "ultimatum" characterization; MPR's own story is decidedly less brinksmanship-esque. Met Council head Peter Bell won't promise zero harm, but argues $800,000 of mitigation will work. More LRT: The MPR spokesperson acknowledges nearby St. Paul firetrucks are already heard indoors, but trains are potentially much worse. The Strib says MPR should pipe down. Not one to underestimate the importance of his creation, Minnesota Public Radio President Bill Kling has already asked us for a significant piece of our income while we live, a major part of our estate when we die, our car whether we're ready to get rid of it or not, and we can expect that one day he'll want our first-born children. All this for "noncommercial" radio, meaning that commercials are limited to 25 or 30 seconds each. The University of Minnesota has determined that its advanced instrumentation can coexist with the light rail line down Washington Avenue. What is so sensitive about MPR, other than its sense of entitlement? Let's make sure that the good of the state, the region and city, rather than MPR, is the criterion for routing this exciting new transportation system. This is an excellent overview of the situation at Minnesota with respect to conflict of interest in the medical school. So let's see... the University of Minnesota committee charged with drafting a new conflict of interest policy included members with conflicts of interests who did not reveal these conflicts to other members of the committee. Its chair had committed a "serious violation" of the current conflict of interest policy, which was known to the medical school dean who appointed him, but which was not revealed to the rest of the committee. That same medical school dean seems to have her own significant conflict of interest, a financial entanglement about which her previous pronouncements have been at best naive.